Dr Muffazal Lakdawala is the Chairman of Institute of Minimal Access Surgical Sciences and Research Centre, Saifee Hospital, Mumbai and Founder, Digestive Health Institute, Mumbai, which is the first Indian Centre for Excellence in Bariatric Surgery. He is also the President of IFSO- Asia Pacific chapter. In his career of 15 years, Dr Lakdawala has conducted numerous surgeries, in India, and abroad; a trained laparoscopic surgeon, he specializes in bariatric surgery and GI oncology surgery. He is known internationally for his pioneering work in the field of scarless bariatric surgery and is a keen researcher in the field of diabetes surgery. 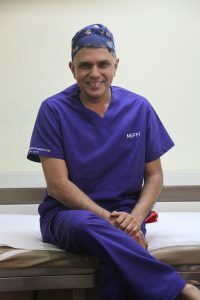 A graduate of the prestigious Grant Medical College in Mumbai, he earned his Master’s in Surgery from BYL Nair Hospital. He went to train further in bariatric surgery at Cleveland Clinic, Ohio and at University of Ghent Hospital in Belgium; he has also trained in advanced colorectal cancer surgery in Seoul, Korea. In March 2017, Dr Lakdawala won the Lokmat Maharashtrian Of The Year 2017 in the Medical Category. The prestigious awards recognise and honour individuals who have contributed positively to the state. In September 2017, Dr Lakdawala was recognised by Giants International, the acclaimed service organisation, for his stellar contributions to the field of medicine. Dr Lakdwala has been in the news, nationally and internationally, this year for his treatment of Emaan Ahmad, the world’s heaviest woman, who reached out to him with a heartfelt appeal to help save her life. Dr Lakdawala arranged for her to travel from Alexandria, Egypt to Saifee Hospital, Mumbai, where he assembled a team of experts to work with him on the case. Under his care, Eman’s weight reduced from 500 to 176 kgs. Dr Lakdawala is also very committed to mentoring and training younger surgeons and is a Professor at the Maharashtra University of Health Sciences. He regularly runs live surgery workshops and has been invited to conduct teaching workshops in almost every Asian country like Malaysia, Indonesia, Thailand, Vietnam, Bangladesh, China, South Korea, Sri Lanka and Middle East. He has the highest number of publications in bariatric surgery in India to his credit and is regularly invited to be on prestigious committees worldwide. Dr. Lakdawala is on the board of Asian Endosurgery Task Force (AETF). Dr Lakdawala is a published author whose debut book, The Eat-Right Prescription, released in 2016, was a bestseller. Its Gujarati edition, titled Uttam Aahar Uttam Jivan, was released earlier this year to much acclaim. He is a TEDX Speaker, as well and his talk on the dangers of sugar in 2016 was very well-received. Dr Lakdawala has been a professional cricketer, playing at the national level, and is an avid photographer. The International Federation for the Surgery of Obesity and Metabolic Disorders (IFSO) is a Federation composed of national associations of bariatric surgeons and Integrated Healtprofessionals. Currently, there are 62 official member societies of IFSO. IFSO-Asia Pacific Chapter was founded in September/October 2008; formation of this regional chapter helpssupport research and multi-cultural exchanges, as well as promotion of awareness and knowledge about bariatric procedures. Digestive Health Institute is dedicated to delivering comprehensive and end–to–end holistic solutions across four spheres – diagnostic, preventive, surgical and continuum, with core emphasis on the treatment of disorders related to digestion and the gastrointestinal tract. We are focused on providing every patient with a customized, medically-certified, sustainable and holistic solution. Digestive Health Institute was founded in 2004 as Centre for Obesity and Digestive Surgery, by Dr Muffazal Lakdawala; for over a decade, CODS gave a second chance at life to patients suffering from almost any gastrointestinal disease, by using cutting-edge technology and holistic care. Dr Lakdawala, who is one of the top bariatric surgeons in Asia is well-recognized and highly respected within the international community for his pioneering work in the field of gastrointestinal diseases. He is the go-to expert for minimal access surgery and brings best-in-class skills to his practice. Dr Lakdawala is also a pioneer in Single Incision Laparoscopic Surgery. Relaunching CODS as Digestive Health Institute in early 2017 has been very significant as Dr Lakdawala assumes presidency of International Federation for the Surgery of Obesity and Metabolic Disorders - Asia Pacific (IFSO APC) this year. Under his guidance and leadership by example, our team has also broadened its experience and expertise in laparoscopic surgery to all disorders related to digestion and the gastrointestinal tract as well as oncological procedures.